Lee's "Triple Action" Wood Corn Cutter and Creamer cuts, shreds and scrapes grains of corn off ears 10 times faster at one-fourth the labor! Cuts smoothly, uniformly and evenly without mess or splatter. Just lay the cutter over a pan with the long end against a wall or backstop, place ear of corn with small end forward and push against the cutter blade with one quick motion. 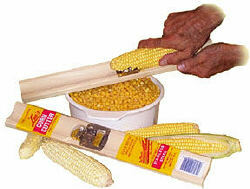 For cream style corn just lower the blade to barely clip off the top end of the grain leaving the shredder on. Set the scraper high enough to scrape milk from the cob skin. For whole kernels raise the blade to desired height for your variety of corn, the proper adjustment will cut grain right off the cob uniformly.